This story’s about a young man named Jack. Jack struggles. It’s how he defines himself, how he classifies his existence. He struggles with depression, he struggles with relationships, he struggles with self-esteem, he struggles with motivation. His is a tale of unfulfilled dreams and frustrated hopes. He’s bitter, broken and crushed. Jack doesn’t remember the last time he had a plan. Plans are for those who believe they can achieve, that with enough perseverance they can make things happen. Jack doesn’t believe that anymore. He’s made too many plans, dreamed too many dreams, only to see them crumble to nothing under the weight of his wrecked life. He doesn’t plan anymore, because he’s too tired to dream. Instead, Jack stumbles through a haze of endless battles, one bitter hurdle after another to be eventually defeated, only to be replaced by the next one. One day, Jack meets a young Jewish man who asks him if he’s Jewish. Jack replies yes; the man asks him if he wants to put on tefillin. Jack declines, but asks some questions about Judaism. The young man tells him about a religion with a place for every Jew, a G‑d with an infinite love for all His children. He tells him that G‑d waits for him, that He’s a father wanting to know him. Jack thanks him, but secretly he doesn’t believe the young man. The young man doesn’t know him, he has no idea of the wreck, the hopeless mess that he is. If he did, he would know that no religion would want him. He knows this, because even he doesn’t want to be him. He walks home, more dejected than ever. Pause. Zoom out. Let’s try a different approach. Zoom in. This story’s about a young man named Jack. Soft-spoken and well-mannered, Jack impresses people with his serious, introspective approach to life. He wasn’t always like that; there was a time when he saw the world as black and white, a simple matter requiring little thought. Yet time’s travails have taught him that naiveté and ignorance are poor defense against implacable facts. Instead of pointlessly hoping things were different, he’s learned to accept life as it is, to accept himself for who he is. He’s lived a hard life, and matured from it. 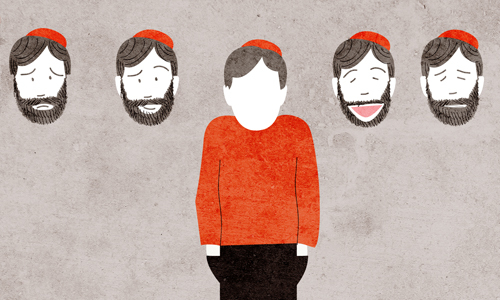 When Jack meets a young Jewish man who talks to him about Judaism, he finds himself curious. The Jew tells him that Judaism is the truth, that it’s a tradition handed down from Moses through an unbroken chain of generations. He explains that it shows us the meaning of life, our purpose on this world. The words speak to Jack, igniting something inside him. He’s intrigued, and wants to know more. As he walks home, he determines to find out more about his religion. Pause. Zoom out. Zoom in. Jack’s a popular fellow. Whenever he enters a room, people stop, gathering close in eager anticipation of entertainment. Jack never disappoints: with an easy smile and a breezy attitude, he regales his audience with a seemingly endless repertoire of jokes and gags. No matter the crowd, Jack can make them laugh (do they see? ), his own laughter joining them (do they see that I have to laugh? ), his voice rising louder than all in as he laughs hysterically (desperately have to laugh) at himself, tears streaming down his face as he doubles over and clutches his knees and shakes with mirth (yes, mirth, that’s what it is, that’s what it is, that’s what it is). He jokes, he laughs, never having to think a serious thought, never quite daring, and when he starts to think he laughs, he laughs and laughs because he knows, deep inside, that if he would think then things wouldn’t be so ha ha ha funny now, no no no, that if he would think he wouldn’t laugh anymore, that he would start to think about his life and what he is and who he is and where he’s going, and then things would become something else entirely (I can’t, I can’t, I can’t). Jack and the young Jew immediately hit it off, Jack entertaining him with his vast armory of various jokes. Finally the young Jew gets a chance to tell him about Judaism, about how it enriches and illuminates one’s life. For a moment, just a moment, Jack’s smile slips, and for just that moment a different look takes his face, a dark one, a scared one. Then the moment’s gone, and Jack’s back. He laughs, thanking the Jew for his time, but he doesn’t intend to ever look into it. This Judaism sounds far too deep and reflective, and he doesn’t like reflective, he’s a joker, reflection is for losers, reflection is for those who like what they see, who don’t reflect and see cracks and breaks and rust and (happy place, Jack, happy place) . . .
Jack’s considering writing a book, detailing the various struggles and hurdles he’s been through and how he’s overcome them. He’s persevered with a fiery will and an indomitable conviction, knowing deep down that nothing is stronger than him. Though he’s faced many challenges, he’s grown to see them as a blessing, an opportunity to grow and reveal the strength of his character. Already his story is famous, people listening with open-mouthed inspiration as this valiant fighter tells of his unwillingness to know defeat. When Jack meets the young Jew, the Jew tells him of the struggles the Jews have faced, how they’ve persevered despite seemingly insurmountable odds. He tells him about a burning fire that cannot be quenched, an innate desperate need that does not know boundaries and limitations. Jack listens and finds that he relates, that in this sometimes sorrowful, sometimes triumphant tale of a nation’s journey he can find expression for his pain. He listens and knows that, at long last, he’s found the goal he’s always been fighting for. Jack knows that he’s found his place. Jack leans back in his chair and sighs. Silently, he stares at his computer, willing the words that he can’t seem to find to appear on the screen. When a friend had suggested writing a fictionalized version of himself, he’d pounced on the idea, certain that he could express himself better through fiction than facts. But ever since this morning—ever since he met the young Jew—he’s not been able to concentrate. He can’t seem to decide which version of himself he wants to create. And, for reasons he still can’t explain, he seems to find it necessary to insert the meeting with the Jew into every version he writes. As he tries to regain his concentration, he finds himself wondering if he should look more into what the young Jew had talked to him about. If someone had asked him a day earlier, he would have said that religion was the farthest thing from his mind. He knew who he was, and religion had no place in that picture. Yet, somehow, one small meeting has shaken that. He’s beginning to question how similar his perception of himself is to the fake Jacks on his screen. The four fictionalized versions of himself all tell the same story; the same events happen to all of them. All that changes is how they view themselves—whether they judge themselves as a failure or a fighter, whether they accept themselves for who they are or instead run from the truth. Yet despite it being the same story, it is their perception of themselves that decides their actions. Has he done the same—has he limited himself unnecessarily? For a moment, Jack feels like he can zoom out, that he can see his life stretched before him. As he watches, he sees countless events unfurl before him, some causing him to redefine himself—here as a success, there as a hypocrite. They’re all true, at least for a time, but time and time again, life shows him that he is so much more. As the image fades, as he begins to zoom back in to the present, he realizes that all the versions of Jack he’s written about are real, at some point in his life. He’s all of them; he’s none of them. He’s captive to his limitations and freed by his possibilities. He fights and he struggles, and he sometimes wins and he sometimes loses, but none of those describe him. Jack’s whoever he lets himself be. Excellent, as always Thanks for writing and sharing. It's a great question, but not really one I'm equipped to answer. I'm not a therapist or any form of psychologist. The point of this story is that, sometimes, we define ourselves in such a way that we limits ourselves unnecessarily. We are more than the definitions that hold true today. That, I believe, is a valid point, and one that can apply to anybody, religious or otherwise, Jewish or otherwise. I happened to have chosen an example of an irreligious Jew, but the message is not limited to him. But as far as having "answers" for people who need help, I am not equipped for that. All I can personally say is that if someone feels they could do with help, they should seek it, and it's not even remotely something to be embarrassed about. On the contrary - taking charge of one's life and being willing to face one's flaws and try to improve is a sign of incredible strength. I hope I addressed the issue somewhat. Let me know if you have any other questions or thoughts.